Really have had to slow down the rate of my OG visits. It wasn’t a purposeful thing. It’s not that actually tired of the food–I really still think it’s fine. It’s more that as things have gotten colder and wetter and traffic has picked up with the holidays and construction and things have gotten busier at the end of the term I just haven’t, well, cared as much as I should. About this place. Cared enough to go. For that I am sorry. Yesterday was the first time James and I went to the restaurant without mama. He did quite well, as always. He’s pretty well-behaved considering he’s three and also considering how little effort I’ve put into that kind of parenting in the last three years. He’s a natural. The server asked us what we’d have and I gave my spiel about the never-ending pasta truly being that–despite that the promotion is long gone by now. 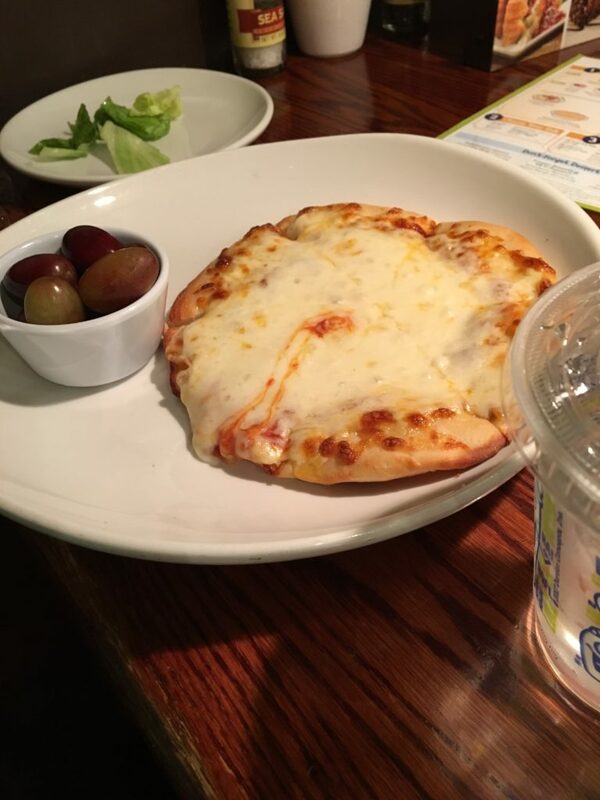 James said he’d like the children’s cheese pizza. This surprised me because usually he just likes to eat whatever pasta we’re eating. 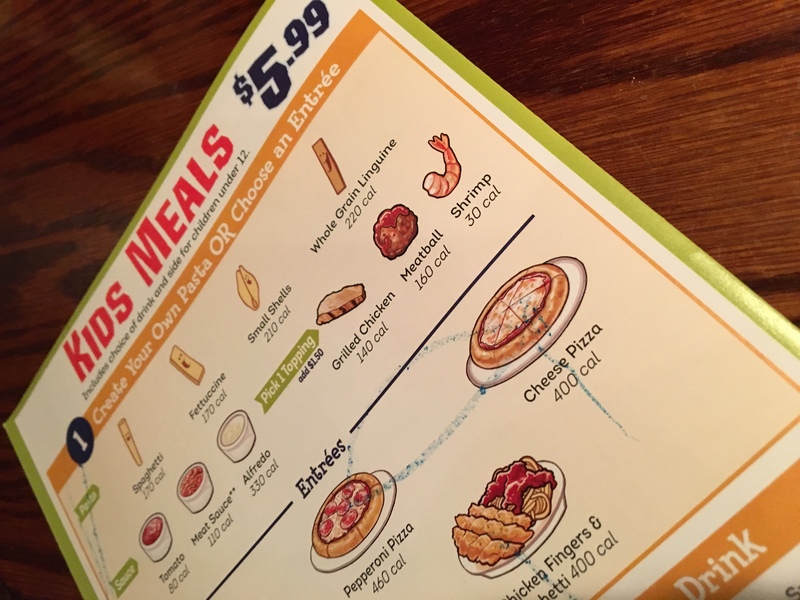 But he insisted and made it clear by drawing an arrow toward the pizza he wanted and using his crayons to cross out the other gross items on the children’s menu. The lady smiled and said they were purple grapes. James said he thought purple grapes were all right. Here he was just being polite, because he doesn’t actually care for red grapes (which is what these really were). The server asked about drinks and James said he was fine with water (he likes to save his money for important things like red vines). She explained that a drink came with his kid’s meal and I asked him if he wanted apple or orange juice in addition to water. He just wanted water. I said maybe orange juice. Water was all he wanted, he maintained. When his meal arrived I gave it some time to cool and then took a slice of pizza out for him. He promptly asked me to replace it on the plate. “I just want to look at it!” He exclaimed. Cool. I went to work on my noodles. A few minutes later he thought it was all right so he started eating a slice. Then the rest of them soon followed. Meanwhile the grapes looked on. In fact the purple grapes which were really red grapes actually turned out to be olive impersonations, which better fit the site of our lunch, anyway. Neither of us were particularly interested in them. When James reaches the end of a slice, he’d hold the tiny crust up to his cheek and call his cat, Calla, from this pizza phone to see how she was doing. He doesn’t like to waste food. When he finished with this, I offered him some of my linguini. He obliged and slurped up a few dozen noodles. At some point the orange juice resurfaced. I ended up drinking some and he just stuck to a couple of polite sips. Water just tastes better, I guess. One chocolate mint was all he asked for, so I pocketed the other three in case one of us needed a bribe. He knows his limits. This entry was posted in Record and tagged food, grapes, James, menu, Olive Garden, pasta, pasta pass, pizza, slow, the Olive Garden.